Meaning: In Sanskrit, “Abhaya” means “fearlessness”. 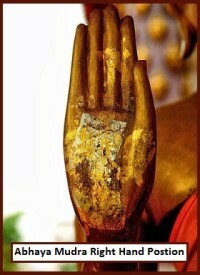 What It Does: This mudra symbolizes protection, peace, benevolence, and the dispelling of fear. It also is an ancient one, demonstrating that the hand is empty of weapons. It indicates friendship and peace. In Buddhism, it’s a symbol of the fearlessness and the spiritual power of the Buddha or bodhisattva. How To: Right hand raised to shoulder height, the arm crooked, the palm of the hand facing outward, and the fingers upright and joined. The left hand hangs down at the side of the body. What It Does: This Mudra helps to evoke courage, fearlessness, and relieves anxiety. It also can stimulate feelings of self-love, acceptance, and ease feelings of loneliness and isolation. How To: Touch tips of all fingers together except for the pinkie fingers. Hold hands out to sides in a cactus position with extended pinkies pointing upwards. 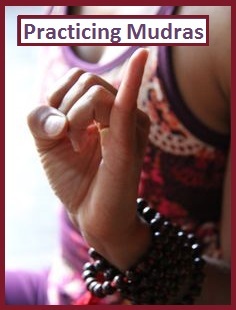 • Mudras can be practiced while seated, lying down, standing, and walking. It is best to be in a meditative mood. • Gertrud Hirschi, author of Mudras Yoga in Your Hands, suggests a good time to practice is a few minutes before getting up and a few minutes before falling asleep, before or after meals, and on your walks. • Pay attention to a symmetrical posture and your breath. To calm yourself, remember to slow your breath. To refresh yourself, remember to intensify your breathing. • Great masters do not agree on the length of time to practice mudra positions. 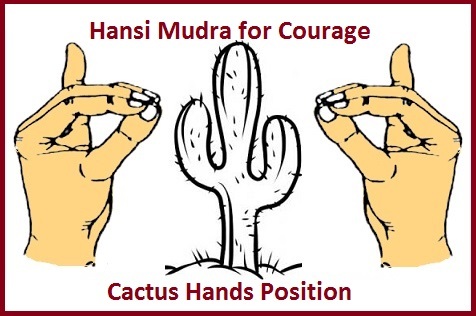 I recommend that you start with holding each mudra 1 to 3 minutes at least 2 – 3 times a day. If you can only hold these positions for one minute and often during the day, you will benefit. FEARLESSNESS FEELS GREAT!